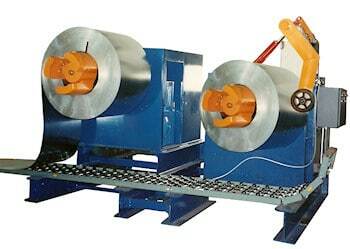 Custom Rollform Products’ Decoilers are designed to meet and exceed the specified requirements to assure years of long life and trouble free service. All Decoilers start with a heavy duty all steel weldment construction and quality Timken bearings to support the arbors. The Coils are supported and held in position with the internal expanded mandrel. Locking the inside core of the coil in place eliminates any sheet surface or edge contact as the strip uncoils and pays off the reel. Custom Rollform Products offers a variety of heavy duty Decoilers with a wide range of standard and special drives and options. Over the year our engineering has developed special design applications for quick changeovers, multiple inline Decoilers and self threading operations. Special drives and loop controls can be adapted to handle high speeds and/or sensitive materials. Dual Mandrel Decoiler 15,000# capacity with Hydraulic Expansion and Hold Down Arms. Two (2) 10,000# Decoilers with over and under loop control to simultaneously feed Foam Panel Line. Our standard lines consist of three (3) Basic Payoff Applications. The Drag Brake Decoiler is used on systems that rely on the inline equipment to pull the strip into the system. The Drag Brake can be used with any Straightener, Rollformer or Rollfeed where the back tension won’t affect the feed length accuracy. 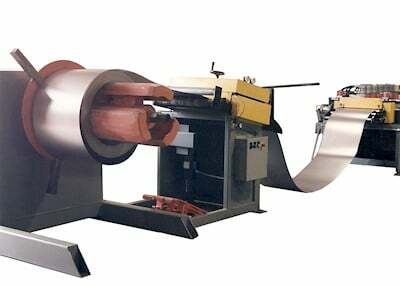 Used primarily on lighter weight coil applications where the coil can be manually fed into the system and or rewound manually. 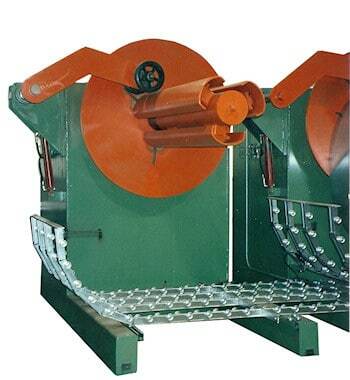 The Motorized Drag Brake Decoiler also relies on the inline equipment to pull the strip into the system. 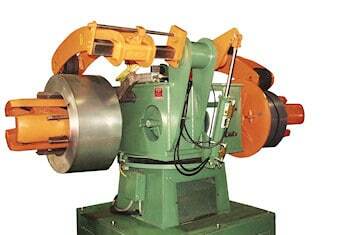 The motorize jog index feed rotates the expanded mandrel when threading or rewinding the strip back onto the coil. In production the Decoiler is a full drag brake operation utilizing inline systems to pull the coil strip from the coil. 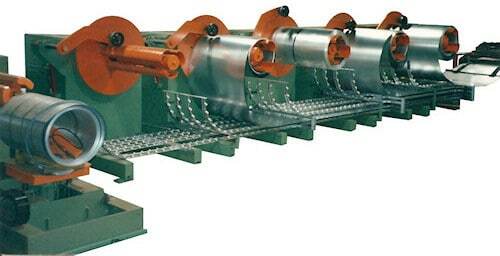 The Powered Loop Control Decoiler is designed to feed and payoff the coil strip into a free slack loop. 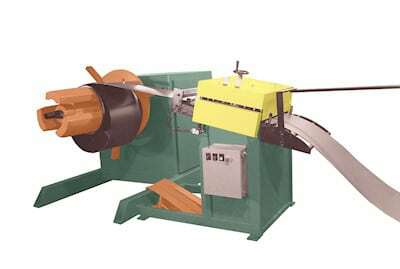 The powered mandrel is used with a remote jog to assist in threading or rewinding the coil strip. Once threaded and placed in automatic, the Decoiler will continuously feed and payoff the coil stock into a free slack loop between the coil and the next inline system. A slack loop control will vary the arbor speed and monitor the feed for a smooth and effortless operation. Five (5) 25,000# Inline Decoilers pre-threaded for a quick changeover of a variety of materials and thickness.